SAP HANA and S/4HANA are at the core of your digital transformation. Protect HANA’s data with Cohesity’s DataPlatform, whether you are running in the cloud or on premises. Cohesity provides a SAP certified integration into SAP HANA, which is based on a native implementation of the HANA Backint API. You can continue to use your existing SAP workflows and tools including SAP HANA studio, DBA cockpit or hdpsql. Protect against logical errors or data loss caused by hardware failures of HANA’s persistent storage layer, and restore to the last state of the database or to any point in time. 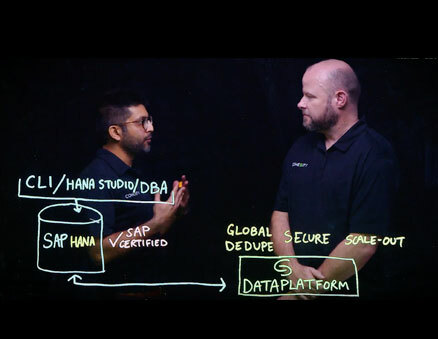 Directly access the HANA database via a fast pipe, multi-streamed across nodes, to send backups straight to Cohesity. Encrypt SAP HANA backups in transit and at rest to enhance data security. Enhance data integrity with two-node / two disk fault tolerance, strict consistency, erasure coding and replication factor. Use Cohesity to consolidate your secondary data and apps from SAP HANA or non-SAP systems, whether you are running on-premises or in the cloud, and then derive more value out of it. Do more with your backup data. Accelerate application development or derive business insights from your backup data, including meeting business and compliance requirements. Looking to protect the data and apps of your SAP HANA system that run your business?